After prices crossed below the EMA, it tried to crossed back but was clearly rejected. 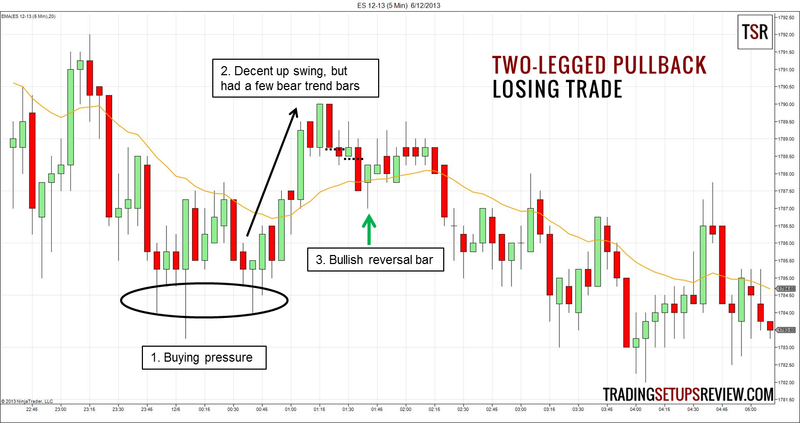 The strong downwards thrust confirmed the down trend, which was what we needed before looking for continuation trades. The two short dotted lines highlight the beginning of each leg up. 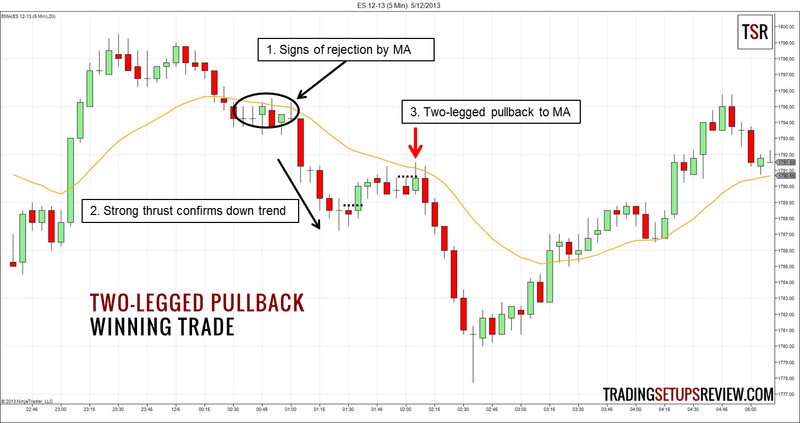 This two-legged pullback looked good with the long top tails that showed as prices approached the EMA. The long top tails implied selling pressure. The day started with swings up and down without a clear direction. However, as prices made new lows, bottom tails emerged, showing buying pressure. The up swing above the EMA seemed strong as there were eight consecutive bars with higher lows. However, there were three bear trend bars within the swing, which hinted at persistent bears. Following a two-legged pullback to the EMA, we had a bullish reversal bar as our signal bar. We entered a tick above it but got stopped out after some sideways movement. Also, with regards to counting legs of price movement, there are many nuances that we did not cover. 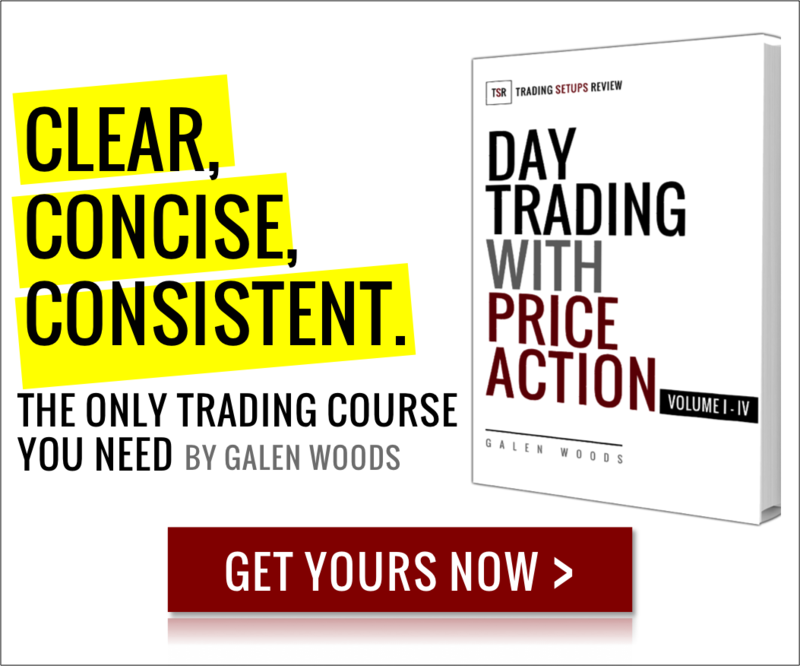 Refer to Al Brooks’ Trading Price Action Trends: Technical Analysis of Price Charts Bar by Bar for the Serious Trader (Wiley Trading) to learn more. First off, congrats on creating a site with such great value. I also highly admire your no-hype, humble exposure. If I may add/alter to your commentary on the first chart (and please do feel free to express what your eyes see as mine can fail me at the best of times on occasion). In trading everything comes down to context. From the first chart, I can’t see the previous bars and so do not know if this early spike (6 trend bars) on a longer time frame is a climatic move or a break out. Having excess to what pursues through the day, I may have to lean towards the fact that this was a climax. Under most circumstances, a spike (esp. as strong as this) tend to retrace for only one leg and fails to reach the MA. It is followed by a channel of some sort which tends to head towards the second target in a measured move. This did not happen over here. Now, since we are talking about a two-legged pullback after a strong move, the initial move (spike) was one that fulfilled that criteria. If a good buying point is after two legs down to the MA, at which point here would one decided OR not decide to take a trade on the long side? Thanks a lot for your additional commentary on the chart. You have pointed out useful observations. To answer your question, I usually focus on the strength of the pullback down. The strength of the pullback down is of course judged with respect to the previous spike (for e.g. retracement %), and other factors like number of bear trend bars and number of consecutive bearish bars. The weaker the pullback, the more likely I will go long. 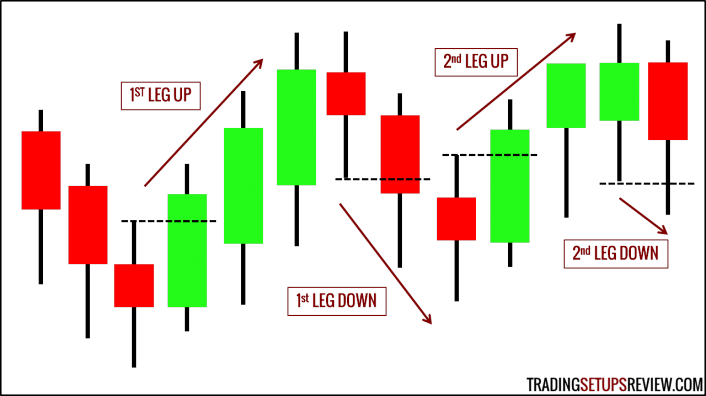 When a move is strong, do you try and make use of the indexes for gauging relative strength or do you play them independently? Whichever you do, what is your reasoning behind it.